Discussion in 'Bonus Spins - Extra Spins - No Deposit Bonuses' started by Marina, Aug 24, 2015. Dazzle Me, the newest NetEnt Slot, will launch at many online casinos today and tomorrow. The game is already live since a few days at Betsafe Casino and some of you may have tried their luck on it already. I find the Random Wild Feature interesting, you could get all 5 Reels full with Wilds. This feature activates randomly. 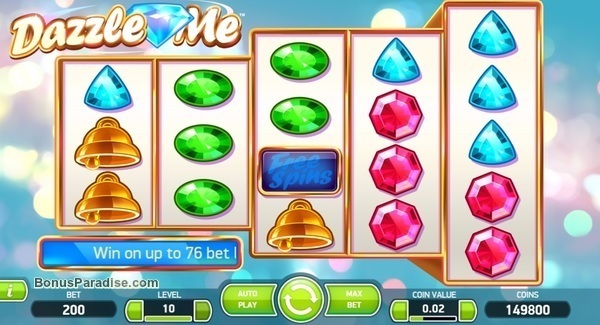 There is also a free spins feature with Linked Reels in Dazzle Me. Hopefully many casinos will award their loyal, active players with no deposit free spins on the new NetEnt Slot. As usual we will post all free spins we get and we appreciate if our members also let us know from which online casinos they got some free spins for the new game. schnitzerchris, Ellis and Mike like this. Redbet Casino added free spins on Dazzle Me for active players. Check also at Heypoker and Whitebet if you played there lately. At Leo Vegas Casino I have 5 free spins on the new Slot Game Dazzle Me! Go check, hope many of you have the free spins! Whoohoo what a nice slot game! Good luck friends with your free spins! Thank you. Hopefully today we get more free games. I have 10 free spins on Dazzle Me at Guts Casino! I have 10 Free Spins on Dazzle Me at Betsson Casino. Check your acccounts, good luck! If you have deposited at Royal Panda Casino in the past 3 month, login and launch Dazzle Me. You should have some free spins on the game now. MyBet Games has the new Slot Dazzle Me now and I got 5 free spins on it! Got 10 freespins at Betsafe Casino. Ellis, Marina and SuperNova like this. I also received them! YIPPIE! Check in your CasinoEuro and Mr Smith Casino accounts. Some players have there now free spins on Dazzle Me!